give you some letters, but not a full word. a computer, perhaps, and not too much time. That's two names down so you'd better get started. Remember - there's loot on this path that we've charted. A reward will be yours, if your number is called. 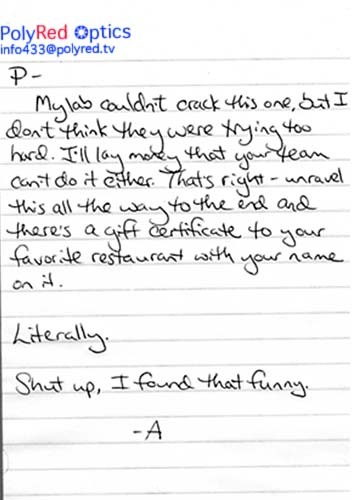 The note was written by one of our friends (who ran a comic store...). The poem was hacked together a day or three before we launched, and we really liked the Conan Doyle bit. A page that looked similar to this was saved as the homepage on all the lab computers in Mudd (back when you could screw with lab computers that way) and we emailed the URL (anonymously of course) to a few friends. About 30 people solved this first clue, but only about a dozen would follow the clues much further.